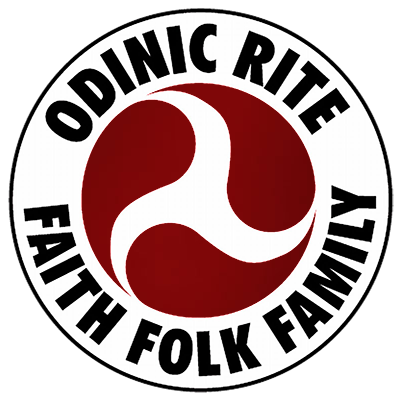 The Odinic Rite’s annual UK Folk Camp was a short but highly successful, enjoyable and rewarding weekend. This year’s camp had a slightly different twist to it as we stayed in cabins instead of tents for the first time since we began holding the annual UK camp. We have seen reduced numbers at camp over the last couple of years due to the inclement weather we can have here in the UK, rarely extreme, yet the year before last saw thirty two hours of non stop rain over the camp weekend which was not a lot of fun! So this year it was decided to rent some cabins to offer more protection from the elements and to encourage those that just don’t do camping to attend. I found a good place in a secluded location near to the market town of Ellesmere in Shropshire and at the right price. The cabins were clean and basic, but had electric light and electrical sockets were roomy enough for people to relax dine on the tables and chairs provided if the weather outside proved to be bad. I arrived at the site early on Friday afternoon so as to be able to greet Folk and show them to the site and their accommodation. I picked up the keys from the reception area and made the short drive to the woods where the cabins are situated and opened them all up and brought some wood for the evening’s fire. Shortly afterwards the rest of the Folk began to arrive and after a brief discussion on where everyone was staying we settled in for the night and prepared food. The evening was spent as always catching up and sharing food, ale and merriment around the campfire. On Saturday we visited the historical Market town of Ellesmere for supplies, and took a walk around the shores of the beautiful Mere, where the children fed the many and varied wildfowl that can be seen. On this occasion Brent, Barnacle and Canada geese enjoyed the feed as did various types of duck and true to form, it seemed that only the ducks were enjoying the weather as it had rained on and off since we had set up camp. We did have a saviour from the elements in the Form of Neil AOR who produced a huge tarpaulin which was erected above the communal area on return to the camp and that provided us with a nice shelter to sit outside and remain dry. In the afternoon Rory ,who is a trained medic, brought out his resuscitation doll “Annie” and gave instruction in CPR for any who wished to learn this vital life-saving skill. This was a comprehensive and very interesting talk and demonstration. In particular the kids were really enthusiastic and practiced on the training mannequin whilst asking Rory lots of questions. It was also very kind and responsible of Rory to give everyone a free First Aid pack to take home with them. Rory AOR had sought the Court of Gothar’s approval to become a professed member of the OR and having received that approval he chose the venue of the Folk Camp to swear his oaths and become one with Odin’s Holy Nation. Rory had asked me to conduct his Profession and it was with immense pride and honour that I accepted. Rory will report himself on the actual Profession, but needless to say it was a very special ritual. The blot preceding was also very moving and powerful, made more so by nine fire torches that Anders B AOR had kindly brought along. During the blot we said a farewell to a popular and lovely man who passed from this realm recently. Anyone who had any contact with Andy Robertson AOR (known online as Pinlighter) will remember fondly a colourful and intelligent character who sadly suffered ill health in the last years of his life here on Midgard. Return to us renewed and refreshed comrade, you’ll never to be forgotten! It was a strange but uplifting blot because the only time the Sun came out that weekend was when we performed that ritual. After the blot and Profession we returned to the camp for the evening’s entertainment. Rewald produced his Guitar and we were treated to Hengest and Redwald live in concert! In quieter moments of the night we discussed various things including how to make next years Folk Camp bigger and better. On Sunday we had to vacate the camp by 1200hrs and so for the afternoon I had pre-booked a session at a nearby archery range where we received instruction in archery before a practice session and then a lighthearted competition. I was a very entertaining afternoon enjoyed by all. The winner was amateur archery enthusiast Tyrsson OR. Well done Tyrsson! The Archery was fun and the Kids really took to it with great gusto! My best mate and minder, Taran, loved it as did young Sean! But well done to all the kids who had a go, some really great shooting From you all! From the archery range we retired for a Sunday lunch at a nearby pub and had some fine country pub grub and nice last couple of hours together before we all hit the road and headed home. All in all a fine Folk Camp, a bit different and a bit of a trial hence the shorter time span than usual. I would like to take this opportunity to thank those that made this a special camp, I hope you enjoyed it and here’s to next year! I’m already making plans!